The introduction of a new product for a cosmetic manufacturing client meant that they had to change their current high speed sorting operation in order to incorporate it into the production system. The current amount of mechanical changeovers required for each product was not a preferable method. 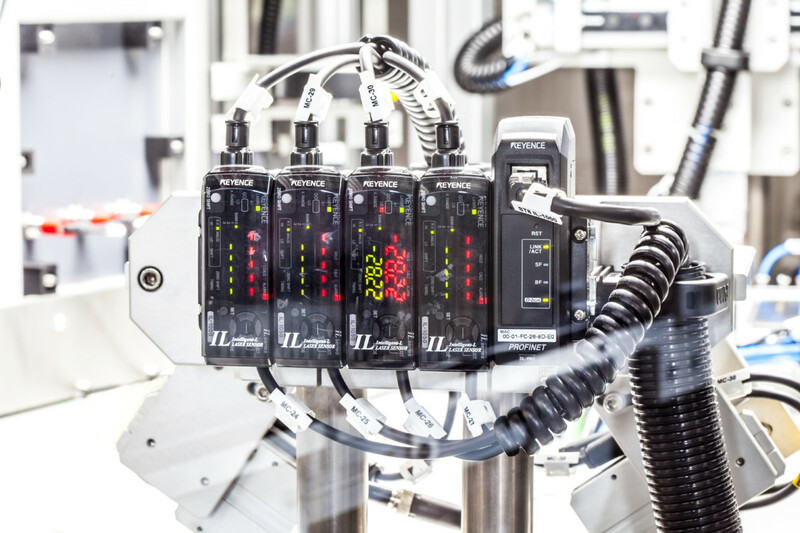 There were six different variations of the product, so the automated solution had to be capable of adjusting to suit different production schedules. System required a line speed of 140ppm (parts per minute) to be expandable to 220ppm. Parts were to be filled/capped then required to be labelled and grouped into sets of 3 or 6 for auto packaging. Customer presented with a detailed project plan in the form of a Gantt chart: timely design reviews with milestone processes showing each stage of the project right through to the installation and site acceptance testing. Final outcome was a fully automated production line taking the products from an existing conveyor into a labelling cell then onward to a grouping correlation module and finally feeding an integrated flow wrapping machine. 12 components were picked using a ceiling mounted ABB 6-axis robot and placed onto a special purpose servo driven indexing conveyor with machined attachments to suit the products. Labelling was then performed as required with various quality inspections carried out on the product before feeding the grouping/correlation robot. ABB flexpicker type robot picked 2 parts, rotated 90° and placed them into adjacent machined nests on a servo driven timing belt conveyor. As the nested parts travelled through the module a base mounted 6-axis ABB robot picked 6 parts and placed them into a moving conveyor in one group of 6 or two sets of 3. Various technologies were utilized for this fast acting cycle. PIAB COAX vacuum cartridges, ABB conveyor tracking technology and servo driven transfers are all combined within a stainless steel fabricated frame to suit the environment. All stages focused on creating a positive, value-driven relationship with the client and striving to learn from their wealth of expertise in dealing with this engineering requirement.